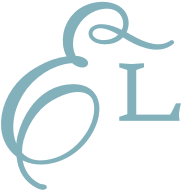 Get ready for the most wonderful time of year with designs that bring out the elegant side of Christmas! 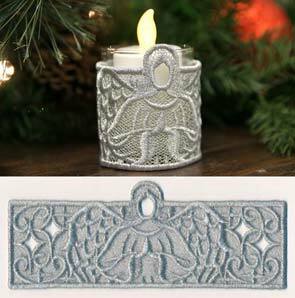 Nativity scenes, freestanding lace candle wraps, silent night whitework cameos and more are gorgeous additions to holiday gifts, decorations, and more. 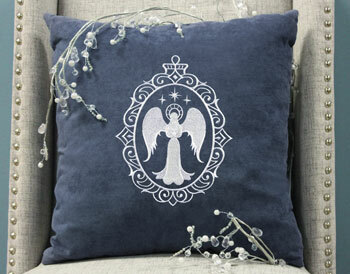 Add a pair of angel wings to your tree, or create a cushion with a playful manger scene. 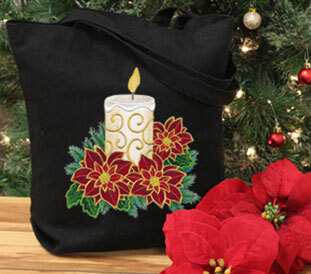 Add the spirit of Christmas to your embroidery with these new designs! 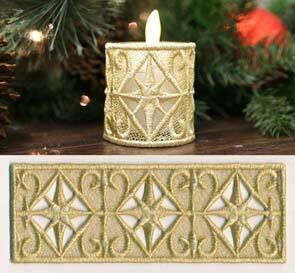 Add a glowing look to your holiday decor with an elegant Christmas candle. 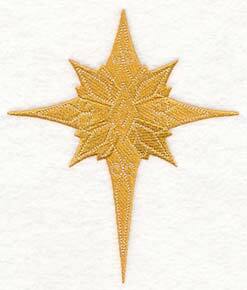 A Christmas candle surrounded by gold-dipped poinsettias casts a soft glow on any embroidery project. 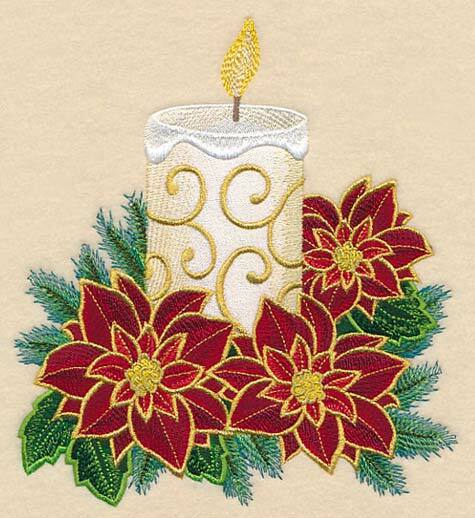 Stitch on a quilt with the other gilded poinsettia designs, or highlight the candle on its own. 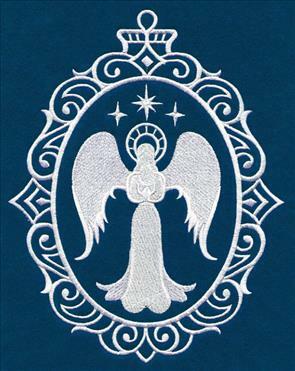 6.85" x 7.52" and 5.84" x 6.41" and 4.84" x 5.33"
Beautiful filigree cameos surround classic nativity icons in this series of embroidery designs. 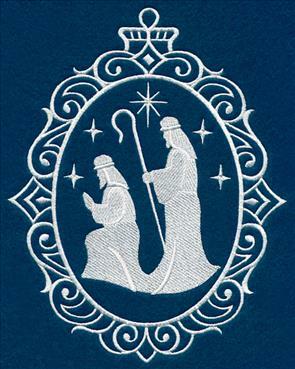 Each of the six motifs -- an angel, dove, manger scene, star of Bethlehem, wise men, and shepherds -- tells part of the story of Jesus' birth. 6.87" x 8.69" and 5.87" x 7.42"
4.87" x 6.16" and 3.07" x 3.87"
The contrast of these whitework cameos against a solid, neutral background showcases their beauty and detail. 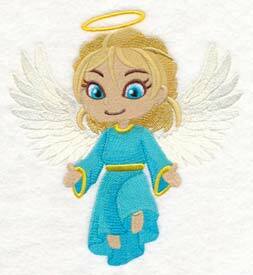 Stitch the cameos on a pillow, a stocking, or even a series of framed artwork! 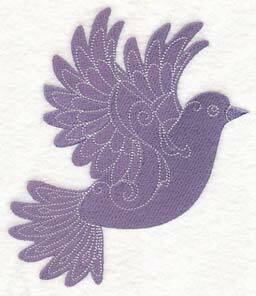 Use all of these graceful designs on a quilt or a series of tea towels. 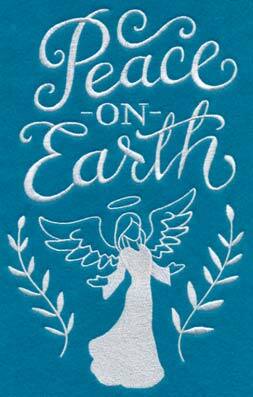 Plus, they're gorgeous on their own on a tree skirt, cushion, or tote bag. 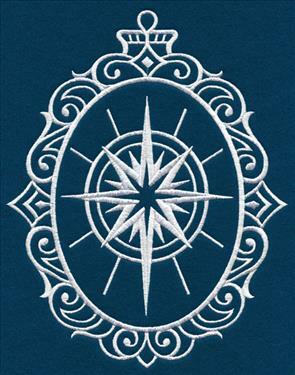 The white stitching of the design is striking against the navy blue background -- change the colors to match your decorating scheme! 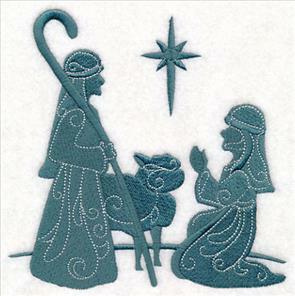 6.86" x 8.68" and 5.86" x 7.41"
Stitch a silent night with lovely nativity cameos. Get them all now in a design pack. 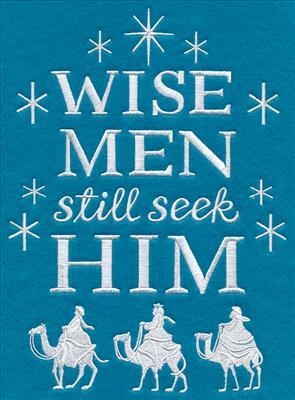 Beautiful whitework stitching depicting classic holiday sayings are striking additions to pillows, tote bags, and more. 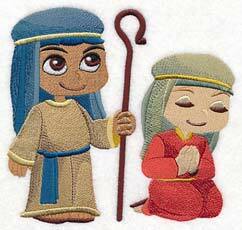 Use to decorate your own home, or give to friends and family to share the meaning of Christmas. 6.87" x 9.64" and 5.57" x 7.82" and 4.87" x 6.83"
The bright teal background is a brilliant contrast to the white words in these designs. Change the colors to match your style, or stitch in the colors shown for a contemporary look. 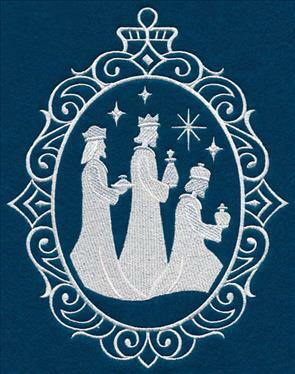 6.85" x 9.41" and 5.58" x 7.81" and 4.85" x 6.79"
Traditional icons celebrating the birth of Jesus add a sophisticated look to any embroidery project. 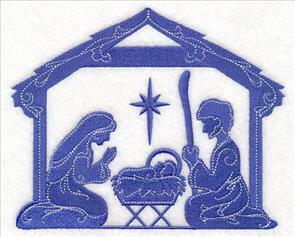 Stitch the manger scene alongside a depiction of an angel, or use them all together to create the entire scene. 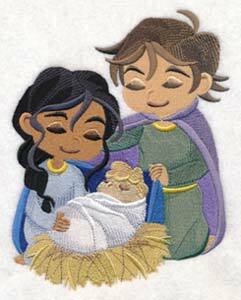 4.53" x 6.48" and 3.24" x 4.63" and 2.70" x 3.86"
The three wise men followed the Star of Bethlehem to the little town where Jesus was born. Light white stitches atop the silhouettes lend a graceful look to the designs. 5.48" x 6.48" and 3.91" x 4.62" and 3.26" x 3.85"
Finish the collection of designs with a dove and the shepherds. 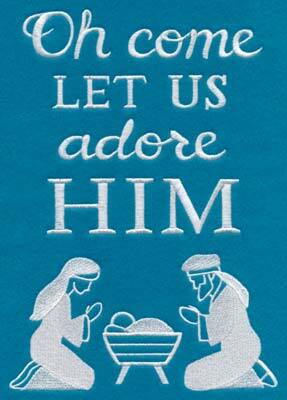 Classic ways to celebrate the reason for the season! 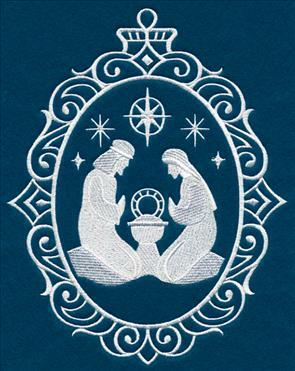 5.86" x 5.85" and 4.86" x 4.85" and 3.87" x 3.86"
Stitch all the elegant nativity designs together to depict the entire events at Bethlehem, or use the single designs on their own. Get them all now in a design pack. 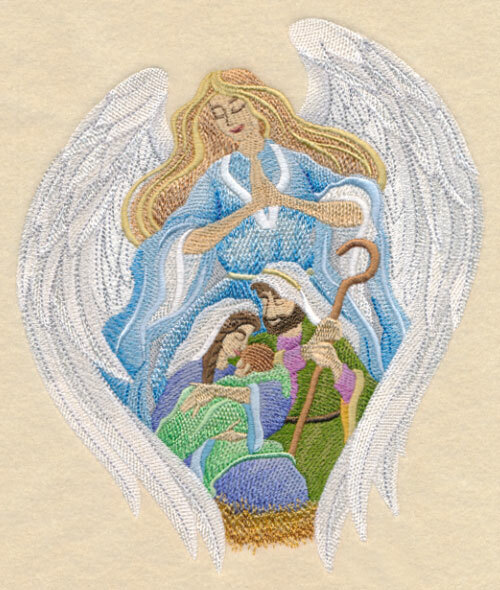 An angel sent from heaven keeps watch over the Holy Family in this elegant design. 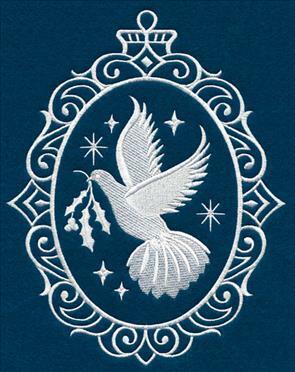 Stitch the spiritual scene on pillows, wall hangings, and other holiday decorations for your home. 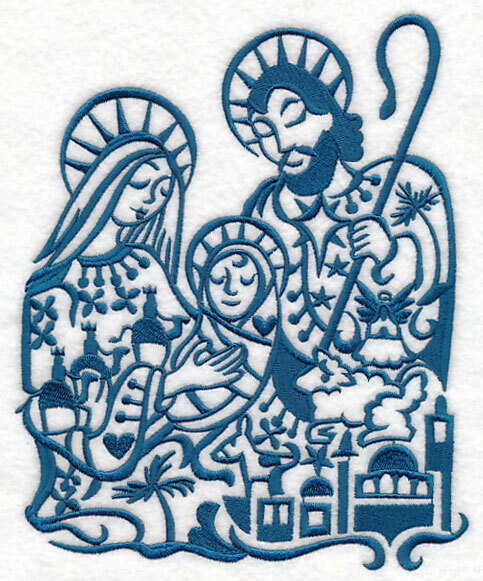 6.59" x 7.79" and 5.85" x 6.91" and 4.84" x 5.73"
A one-color motif featuring the Holy Family is a quick-stitching way to embroider for the season. Hidden spiritual accents, including the wise men, star of Bethlehem, and more can be found within the details of this Christmas scene. 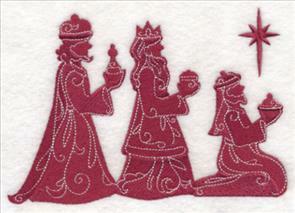 6.46" x 7.81" and 5.86" x 7.08" and 4.86" x 5.87"
Every Christmas needs a holiday pageant! 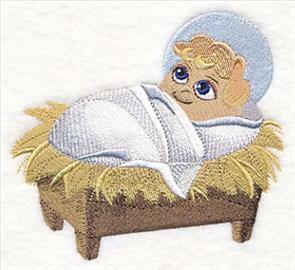 These sweet scenes depict the birth of Jesus in a soft, precious way, including the Holy Family, the baby in the manger, and more. 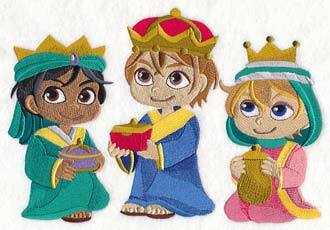 4.69" x 4.26" and 3.83" x 3.54" and 3.43" x 3.12"
From shepherds to the three wise men, each part of the classic story is represented in these designs. 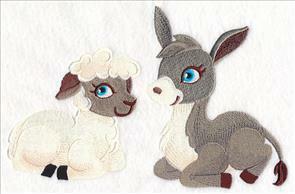 Stitch them all together on a quilt, wall hanging, or framed art. 6.13" x 5.80" and 5.08" x 4.81"
9.39" x 6.44" and 7.79" x 5.34" and 6.85" x 4.70"
The angel and the animals add the final touches to this set of pageant stars. 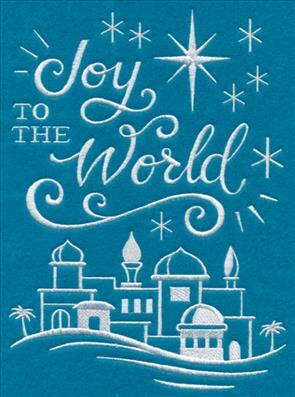 Brilliant for kids' gear, or sweet holiday decor. 6.01" x 6.52" and 4.99" x 5.41" and 4.39" x 4.76"
This collection of adorable designs is perfect for a wide variety of Christmas projects. Get them all now in a design pack. 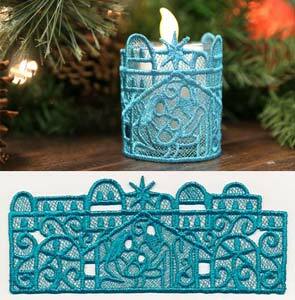 Stunning freestanding lace wraps around battery-operated candles to create a gorgeous addition to any Christmas decor. 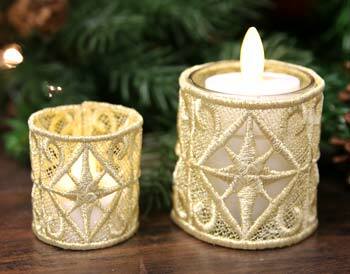 The wraps come in two sizes -- one for votive candles, and the other for tea lights. 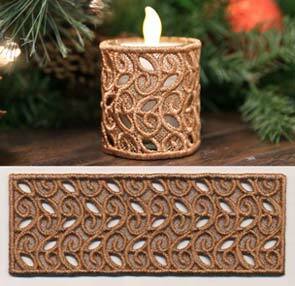 Find out how to create the candle wraps with this helpful tutorial. 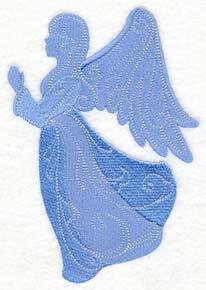 6.88" x 2.55" and 5.26" x 1.95"
6.88" x 2.68" and 5.23" x 2.04"
A pair of beautiful angel wings are delicate additions to any Christmas embroidery. 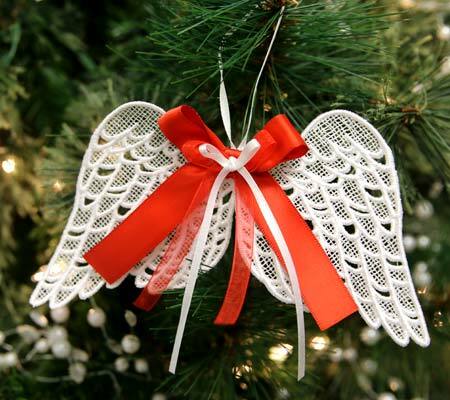 Use as an ornament on your tree, or to decorate a gift. Find out how to create these wings in this helpful tutorial. 4.87" x 6.47" and 4.15" x 5.51" and 2.94" x 3.90"
Sue wrote in asking for a square that featured the fun parts of winter -- what a great idea! 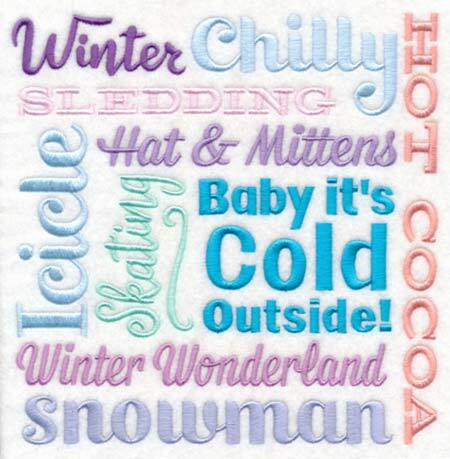 Words including "hot cocoa," "snowman," and "winter wonderland" give this design tons of seasonal style. 7.78" x 7.82" and 6.87" x 6.90" and 5.87" x 5.90" and 4.87" x 4.89"